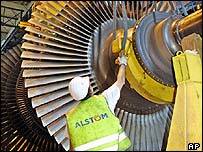 France's bail out of its troubled engineering company Alstom has been approved by the European Commission. Alstom ran into problems after a string of business disasters that led to a loss of 1.84bn euros (£1.23bn) in 2003, much more than the market had forecast. The rescue package put together by France is valued at about 2.5bn euros. One condition imposed by the EU is that Alstom, which makes ships, trains and power equipment, form partnerships across a number of its key businesses. This has already proved controversial with France and Germany who traded verbal blows last month. German Chancellor Gerhardt Schroeder was incensed by what he claimed was French nationalism after an attempt by Siemens's to buy into Alstom was blocked. French finance minister Nicolas Sarkozy had been a vocal supporter of state intervention, saying he did not want to see Alstom broken up and sold off to foreign rivals. He seems to have got his wish, although the company will have four years in which to find partners for its key divisions. Alstom has agreed that it will first find investors for its hydroelectric business. The European Commission, the executive arm of the EU, said it "considers the commitments of partners as essential to dispel all doubts about the long-term viability of the enterprise". The EU said that it will not help Alstom choose future partners, but added that any potential tie up must not be with a French state-controlled firm. Alstom also plans to sell businesses with total sales of as much as 1.6bn euros, cutting its size by an extra 10%. The company already has trimmed itself by a fifth. Divisions that have been identified for sale so far are worth about 800m euros. They include the company's industrial boiler unit, its freight locomotive business in Spain, as well as Alstom's transport operations in Australia and New Zealand. The EU also wants France to open up its domestic train industry to greater competition and get rid of its Alstom stake within a maximum of four years. Alstom, meanwhile, is banned from making acquisitions in the transport industry during the next four years. "These important measures - including divestitures, opening of the market and restructuring - permit the re-establishment of healthy competition," the EU's competition commissioner Mario Monti said in a statement. "The $3bn package may go a long way to restoring the health of the company"